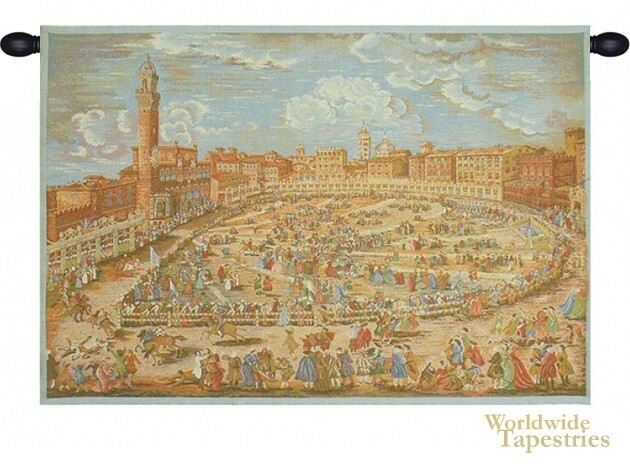 This Siena Town Square tapestry shows a panorama of the Piazza del Campo in Siena, Tuscany. This square is one of medieval Europe's most well know town centers and squares and has gorgeous architecture including the Palazzo Pubblico or town hall built in 1297 and Torre del Mangia or tower built in 1338 built to the exact same height as Siena Cathedral as a symbol in those times that the state has as much power as the church. This Siena Town Square tapestry is backed with a lining and a tunnel for easy hanging. Note: tapestry rods and tassels, where pictured, are not included in the price. Dimensions: W 25" x H 16"